While the original Streets of Rage was certainly an excellent game in it’s own right, this sequel was not only the pinnacle of the series, but one of the best games on the Sega Genesis. 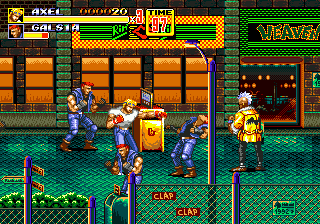 Streets of Rage 2 maintains the same basic feel as the original, but every aspect of the game has been improved. Each character, in addition to their individual strengths and weaknesses, has their own special move which can be executed with a simple d-pad/button combo. The “police back-up” option has been removed, replaced by a second special move that delivers more damage while subtracting some of the character’s health. The game retains the variety of weapons that can be picked up and used, but gone are the smoke bombs, which were a favorite of mine. The first Streets of Rage certainly had decent graphics, but the improvement here is dramatic. Sprites are larger and more detailed, and everything is more colorful. The sound effects, which I didn’t much care for in the first installment, have been greatly improved as well, contributing to a game that sounds great overall. Once again the game has been scored by Yuzo Koshiro and there is some debate over which of the two games has the better soundtrack. I personally think that both games have such amazing music that there’s really no need to try and rank them. Streets of Rage 2 is often compared to and measured against Final Fight, and many people prefer that game to this one, but I just don’t see it. Some feel that the game is overrated and suffers from “Final Fantasy VII” syndrome, wherein the hype has built the game up to be something more than it is. I can’t disagree more. I didn’t discover this game until well after the 16-bit generation had faded into obscurity, and it is my firm belief that Streets of Rage 2 is the greatest beat ’em up title ever released. Tagged Beat 'em Up, genesis, Review, sega, Streets of Rage 2. Bookmark the permalink.